The Mäuschen is a German tier 9 heavy tank. In summer 1942, the Porsche company received an order for the development of an assault tank with as much protection as possible and a powerful gun. One of the results of the superheavy Maus tank's development was the Typ 205 Mäuschen, a design project with the same interior. Existed only in blueprints. The Mäuschen (Little Mouse) was first introduced in the 8.8 Version of WoT as a new predecessor to the Maus but WG later removed it, since it was deemed very unbalanced (practically unbeatable against tier 7 and many tier 8s due to its armor and 150mm gun, while being very underpowered in tier 10 matches). It was reintroduced in the 9.17.1 patch with buffed health, mobility and gun stats, but no longer having a 150mm gun as an option, and with less side and rear armor. The Mäuschen leads to the Maus. -Highest HP of any Tier 9 Tank (2300), higher than many Tier 10 Heavies. -Painless stock grind; All of its modules don't need new suspension to support more weight, stock gun is decent for its tier, and only has one turret to be used. Similar to Japanese Super Heavies. -Very slow and large; main target for SPGs. The radio is carried over from earlier tanks, mount it immediately. Go for engine next, as it gives more mobility for this tank, and also decreases the chance of it catching fire. As stock suspension can handle all top modules, and you don't have a second turret to grind, you may go for the top gun by unlocking it, the only way to get the XP for the Maus. The suspension is unnecessary. although it gives you a little more traverse speed. 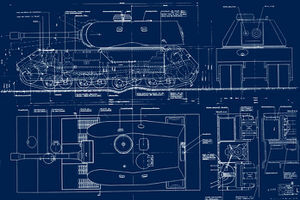 The in-game Mauschen is based on an intermediate step in the development of the Maus, specifically the blueprint K.3385, dated to November 14, 1942. On June 25th, 1942, Krupp supplied the first draft of a completely reworked turret. Almost a month later, on July 17th, the 6th Waffenamt and Krupp signed contract #SS 006-4467/42 for the development of a turret for the Pz.Kpfw. Maus. The 128 and 105 mm guns were left out, and the designers settled on a 149 mm gun. The length of the barrel was reduced to 31 calibers, which was about the same as the sFH 18 gun family. The gun, indexed 15 cm KwK L/31, had one piece ammunition. Nevertheless, the 15 cm L/31 gun remained in correspondence until March of 1943. A coaxial 75 mm L/24 gun was meant to fight infantry and lightly armoured targets. The armour thickness of the turret was 250 mm in the front, 200 in the sides and rear, and 80 mm in the roof. Overall, the turret weighed 57 tons, including the weight of 25 149 mm shells and 50 75 mm shells. Even though the turret was designed for the 15 cm KwK L/31, the Porsche K.G. project supported the guns proposed in June requirements: the 15 cm KwK L/37 or 12.8 cm KwK. Both guns had a portion of their ammunition in the turret and a portion in the sponsons. None of the guns had the 100 rounds that Hitler demanded. By October of 1942, the mass of the turret and armament was estimated at 47 tons. The redesigned Pz.Kpfw. Maus was presented by Porsche on October 5th, 1942. By October 28th, blueprint K.3384 was ready. The mass of the tank increased only a little bit compared to the late June version, a mere 10 tons. The tank, however, changed beyond all recognition. The new turret had a larger turret ring, so the sloped sides had to go. The hull resembled a box with a sloped rear and front. There was a new feature, a machinegun mount in the hull. Due to the longer and heavier hull, there were now 8 road wheels per side. For ease of service, instead of one wide track, there were now two narrower ones, like on the VK 40.01(P). The project was proposed in two variants. The first, indexed Typ 205A, had a 12 cylinder V-type water cooled 42.4 L Daimler-Benz diesel engine, which produced 1000 hp at 2400 RPM. The second, Typ 205B, had a Typ 141 engine developed by Porsche K.G. This was an 18 cylinder air cooled 41.5 L diesel engine that produced 780 hp at 2400 RPM. A decision was made to keep it safe and develop both projects in case one engine doesn't work out. In November, the main candidate for installation became the Daimler-Benz 603 aircraft engine. Its power output could be increased to 1500 hp with a compressor. This increase in power was mandated by the fact that the tank's armour kept growing and it now weighed almost 170 tons. Understanding that these massive weight will cause trouble, Porsche allowed the turret armour to be decreased by 10%. Thanks to this, the mass of the turret dropped to 43 tons. In early November of 1942, the tank was reworked again. By November 14th, blueprint K.3385 was ready, where the turret moved to the rear of the hull. Similar metamorphoses happened to the Porsche Typ 180 heavy tank (VK 45.01(P)). 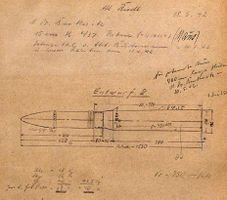 Blueprint K.3885, November 14, 1942. This is the version of the Mauschen that is in-game. Documentation of the 15 cm Kwk L/37 gun. While the Mauschen's turret was meant to hold the 15 cm Kwk L/31, both the L/37 and the 12,8 cm Kwk were considered. This page was last modified on 14 September 2018, at 17:06.